How Does Frozen Ground Affect Land? Figure 1. Small hills, called pingos, form in areas with frozen ground. 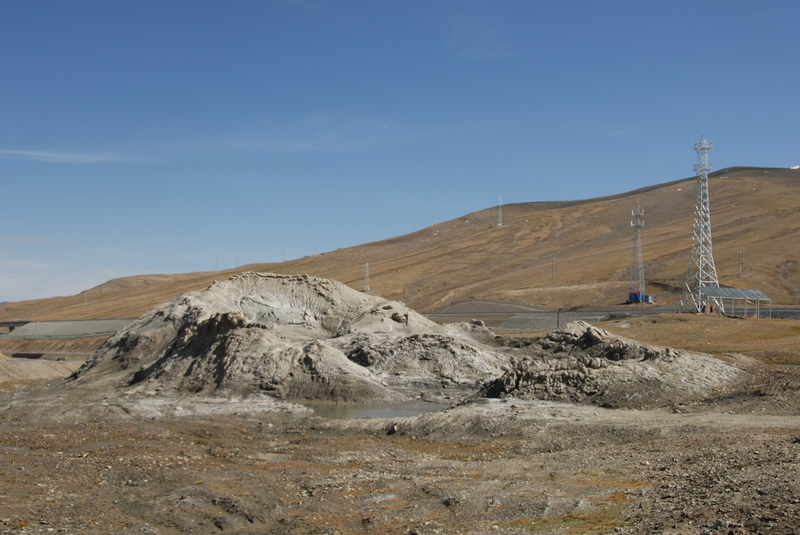 This pingo formed near Kunlun Pass on the Qinghai-Tibet Plateau in China. When the ground freezes or thaws, it can change the shape of the land. Some effects of frozen ground may be familiar, such as potholes in a road, caused by freezing and thawing ground. Sometimes frozen ground creates landforms. People who live in the far north may have seen some of these landforms, but to people living farther south, the landforms are odd. The Tibetan Plateau in China is one place that has some surprising landforms caused by frozen ground. The plateau is relatively flat and treeless. But in some places, hills rise into the sky like miniature volcanoes. Some are 50 meters (164 feet) tall. These small hills are called pingos (Figure 1). Pingos form when liquid water underneath the ground is under pressure. The water slowly feeds ice layers that push up the ground from underneath. Some people have seen pingos explode, throwing ice and water all around. Pingos are also found in the Arctic. When water turns into ice underground, it expands. This can make the ground move, causing frost heave. Frost heave lifts up the ground, as well as everything on top of it. Frost heave can be strong enough to move and damage roads, bridges, and buildings. Frost heave is especially strong where there is permafrost or deep seasonally frozen ground . When frozen ground thaws, the ice in the ground melts. The ground sinks to fill the space left by the ice. The amount of ice and how quickly it melts can vary from place to place. Because different patches of ground may not thaw at the same rate, melting ice can make the surface uneven. Uneven thawing can make roads wavy. Driving on these rising and falling roadways can feel like riding a roller coaster. Figure 2. These strange-looking ice crystals, called needle ice, formed on frozen ground. What kinds of landforms does frozen ground create? Frozen ground can freeze and thaw, and ice layers can grow underground. These processes create features called landforms. Some of these features can form anywhere that the ground freezes, and others can form only in places with permafrost. Frozen ground landforms have special names. Needle ice can form any place where the ground freezes. It crunches when stepped on. 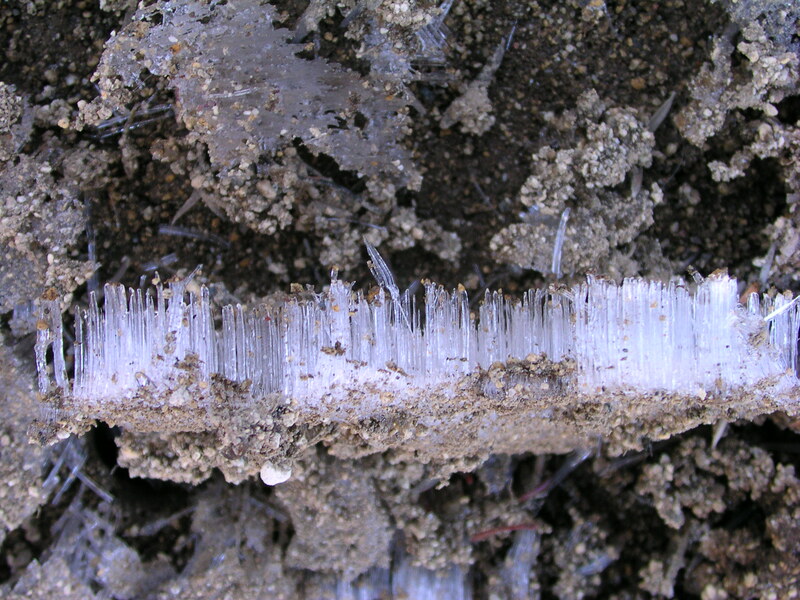 Needle ice is made up of thin ice crystals (Figure 2). 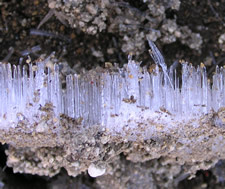 The ice crystals grow upward, starting a few centimeters (inches) underground. If the air stays cold enough, needle ice can grow forty centimeters (sixteen inches) long. In the Arctic, giant areas of circles, stripes, or other shapes form on the land (Figure 3). These areas are called patterned ground. Patterned ground forms when water and ice in the ground move the rocky soil around. Giant towers of layered ice can form from small cracks in the ground that keep getting bigger. These towers are called ice wedges. To see how ice wedges form, visit the Periglacial Ice Wedges Animation Web site. Pingos are small hills up to 50 meters (164 feet) high. Pingos form when thick underground ice pushes up the top layers of soil. Palsas are hills similar to pingos, but smaller. Palsas form when ice attracts liquid water. They have layers of soil and ice. Palsas occur in wetland areas. Rock glaciers are rivers of rock, dirt, and ice, which slowly flow downhill. Rock glaciers are different from ice glaciers because they form from material on the ground. Ice glaciers form when snow falls on the ground and compresses into ice over many years. 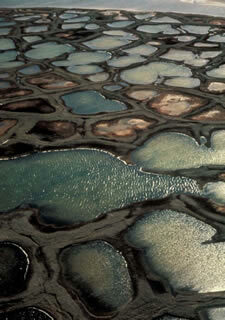 Thermokarst lakes form when permafrost thaws and releases water. Ice melting beneath thermokarst lakes causes the lakes to deepen over time. Figure 3. 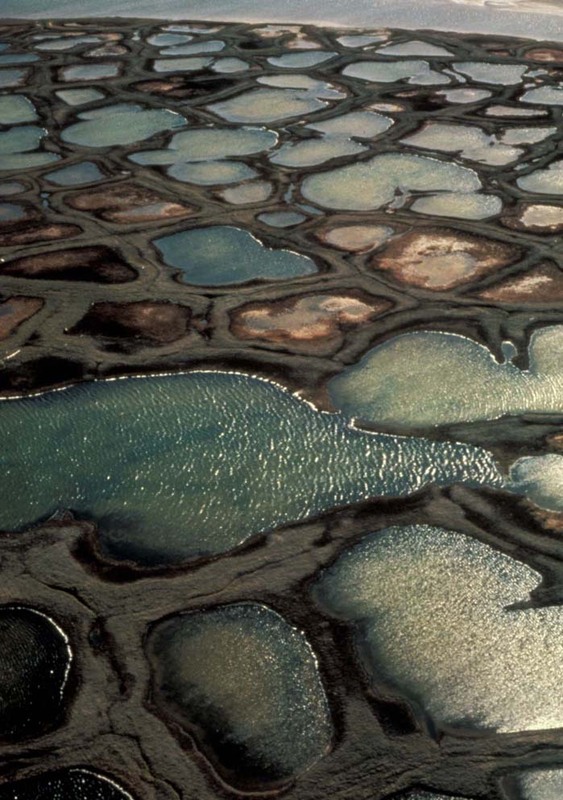 A photograph taken from the air reveals patterned ground surrounding thaw lakes in Alaska's Arctic National Wildlife Refuge. Frozen ground causes formations like these. Figure 4. 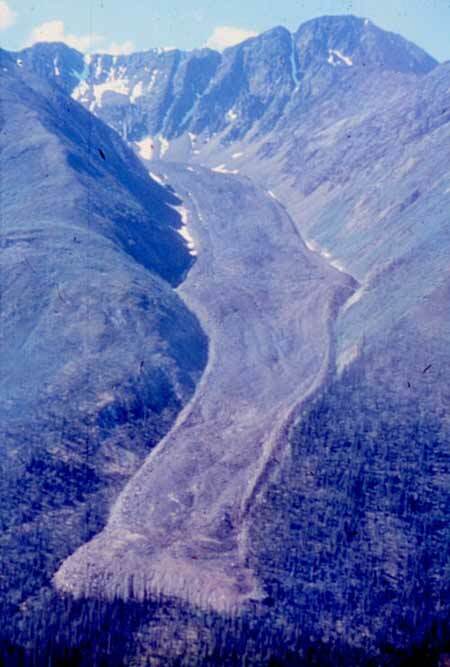 This river of rock, dirt, and ice is called a rock glacier. Rock glaciers contain more rock and dirt than ice. This rock glacier is in Northwest Territories, Canada. Figure 5.These big lumps in the ground are called thufur. Thufur can form when the ground freezes and thaws. These thufur are in Iceland. Hummocks form in areas with dense soil that has small particles, like clay soil. When the water in the soil freezes and thaws, it can push up smooth lumps of soil. 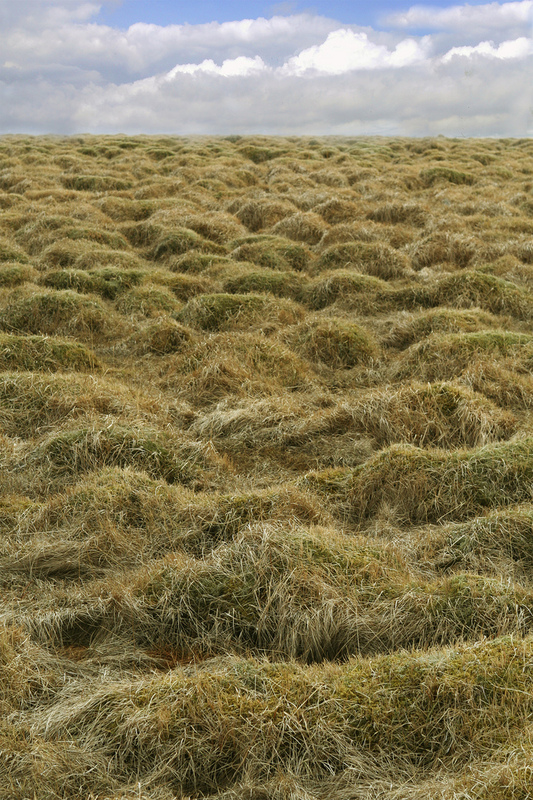 Hummocks often form in large groups. They can form whether or not there is permafrost underneath. 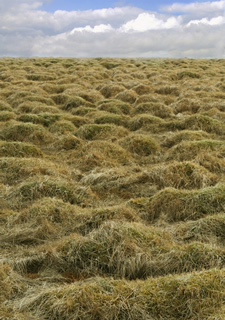 Thufur are huge hummocks that last from year to year (Figure 5). They can be more than half a meter (1.6 feet) high. Thufur form in either the active layer in permafrost areas, or in the seasonally frozen ground in non-permafrost areas, during freezing of the ground. Figure 6. The leaning trees in this Alaskan forest tilt because the ground used to be permanently frozen, but it thawed. Forests like this are named drunken forests. When frozen ground thaws, can it change the land? When frozen ground thaws, the environment can change dramatically. For example, thawing permafrost on mountain slopes can lead to landslides. 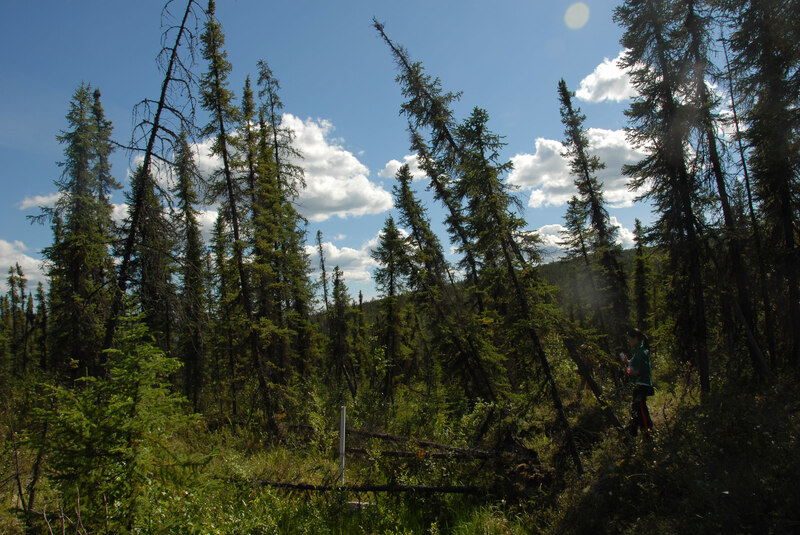 When permafrost thaws on level ground, it can buckle the ground. Trees growing nearby can be at risk. Sometimes, their roots become so weak that trees tilt and fall over. These trees are sometimes called a drunken forest (Figure 6). In areas near coasts, permafrost and sea ice work together to protect the shore from ocean waves. When sea ice melts away and permafrost thaws, waves hitting the shore can damage the land and lead to erosion. Sometimes, the land collapses into the ocean. See Climate and Frozen Ground for more information on thawing permafrost and climate change.